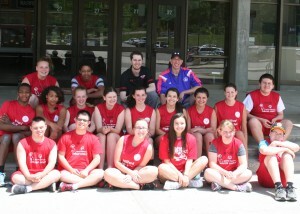 The Milford Special Olympics activities throughout the year are under the supervision of Jennifer Walsh. Programs are open to both residents and non-residents. Our mission to provide year-round sports training and competition in a variety of Olympic-type sports for all children and adults with intellectual disabilities, giving them continuing opportunities to develop physical fitness, prepare for entry into school and community programs, demonstrate courage, experience joy and participate in the sharing of gifts, skills and friendships with their families, other Special Olympics athletes and the community. Special Olympics activities are open to individuals from ages 8 and up for competition and ages 6 and up for training. Programs include School Day Games, Special Olympics basketball, track and field, flag football, cheerleading, softball, cycling, power lifting, bocce, soccer, swimming (including swim lessons), power lifting, bowling, and wrestling as well as dances and other social activities. Schedules vary with each program. Please click on the link below for a printable schedule. Need program details? Click the red box below to get to our Activity Registration site. Then, if you click on the blue “Click for Activities” button, you will be brought to a page where you will find the Special Olympics programs by sport. To find a program, go to our online registration page, then click on the Click for Activities button, then click on Special Olympics. You can register online while you are there or you can still register offline. Just fill out the paper registration forms (click here for our registration forms page) and send to Jennifer Walsh at the address below. You may register by mail, in person, or by email at jwalsh@milfordma.com. Our office is located inside Milford High School. For security reasons, the office is only accessible by appointment. You may visit our office without an appointment after school hours – from 2:30-3:30 pm. If you are dropping off your registration, you may leave it with the security officer at the front door or put it in the Milford Community Program drop box on the left wall of the security kiosk. Separate registration forms are required for each program. If you have any questions, please call Jennifer Walsh 508-478-1100 ext. 1121.